Scarring can be the result of many factors, from injury and surgery to aggressive acne and even losing weight. Understanding what type of scar you’re dealing with can help you find the optimal treatment for your skin. Believe it or not, scarring is actually a natural part of the skin’s healing process. When the dermis (the second deepest layer of the skin) is punctured or injured, the body immediately goes into ‘healing mode’, initiating a series of processes to close up the wound and repair the damaged tissue. One of the steps include the dermis sending out collagen-building cells to start rebuilding the damaged tissue. During this process, an overproduction or underproduction of collagen results in scarring. Many factors outside of your control affect the severity and appearance of your scar. Scars that occur on body parts that have to bend a lot or incur a lot of friction like the knee or the foot tend to be more prominent as these movements can disturb the healing process. Fairer skin tends to be more susceptible to noticeable scars. More mature skin tends to contain less collagen and elasticity. This slows down the healing process and increases the likelihood of scarring. Genetical factors as well as hormones can also affect the severity of scars and hyperpigmentation. Raised, discolored scars are the result of the body’s overproduction of collagen during the healing process. These are the scars that rise above the surface of the skin. 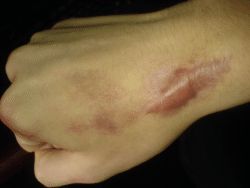 Clinical studies have shown that silicone gels can help these type of scarring. You guessed it. Sunken scars, aka atrophic scars, are the ones that are flat, and depressed below the surrounding skin. Common atrophic scars are acne scars and pockmarks. 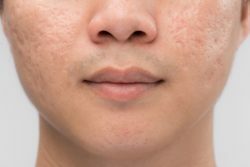 Treatments for this type of scar includes chemical peels, dermabrasion procedures, laser treatments, surgical excisions, or scar vanishing creams. A second or third degree burn can result in a contracture scar, which is when the skin pulls in and tightens. This can impair your ability to move in the affected area. There is also a risk of the scar deepening which can affect your muscles and nerves. Therefore these types of scars must be treated immediately. Typically treatment requires a surgical incision and skin grafting. Stretch marks, aka striae distensae, are yet another category of scars. These generally occur on breasts, thighs, hips, lower backs and buttocks. They can be the result of pregnancy or puberty, as well as dramatically losing weight or gaining weight. Stretch marks occur when the skin tears when the body grows or shrinks too fast. They initially have a red or purple color, but eventually will fade and appear white or silver. Different types of scarring may require different treatments. Generally there are many types of procedures that you can undertake. You can get a surgical removal or treatment like skin grafts, excision, dermabrasion, or laser surgery. 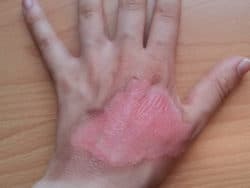 Skin grafts are typically used for burn scars. This is when you remove the skin from another part of the body and use it on the affected area. Steroid injections are typically used to treat raised scars. You can also inject collagen or other fillers to temporarily treat pitted or sunken scars. Scar vanishing creams are another option for those who are looking for a more natural or non-invasive way to reduce the appearance of scars. Our favorite one is Amaira’s Advanced Scar Vanishing Cream with Marine Botanicals. This product can be used to treat many types of scars, from surgical or acne scars, to stretch marks, cellulite, and other skin blemishes. It contains natural and effective ingredients, which produce visible results in a small amount of time.